I think I need to UP my own rate. 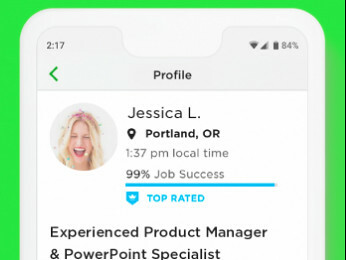 Wendy and others who are billed at over $100, do you think you could find full employment if Upwork were your sole source of clients? I agree that higher rates can be charged, but I'm not sure that attempting to do so on this platform is time effective. Nope. Succinct and honest. I can't speak for others but am guessing we are all approaching full-time freelance in a similar fashion. - Self-marketing and networking are essential. This includes your local market - even if you despise the thought of having to occasionally dress nicely and smile. - Having a website is almost mandatory. - LI is your friend. - Lay the groundwork for referrals from current and prior clients. Then reciprocate in-kind when possible or in some manner. - Investigate other platforms and evaluate them for your particular skills and needs. Tonya, more than anything it is important to maintain contact with happy clients from prior jobs. - Spotting those few really good jobs from which (if awarded) you can develop a long-term relationship with a client. - Picking up a few quick dollars. - Spotting trends in buyer needs. - Meeting some nice folk in the chat rooms. Maybe we can hone in on the breakaway point. At $100, Wendy says no. At $58, I believe I would have no trouble keeping the roster full through Upwork if I had time to do that. I frequently decline invitations because I'm too busy. So, based on this very small sample, the magic number seems to be somewhere in between. Perhaps others will add some data and we'll learn something valuable. 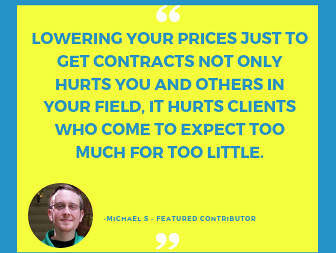 For the longest time I thought there was no way I could pull my rate at $50/hour at Elance and struggled. And here I am at $75 with no problems although I have a lot of repeat business so I don't have to sell constantly. All customers except 2 are on my new rate. At $100/hour I would only need to bill about 18-20 hours a week to be happy. I'm currently billing about 30-35 because things have been nice for me with repeat business and right now I think I've only tackled one new project in the 3-4 weeks through an invite that was only 2.5 hours. So, who knows. I think if you built up a client base that it's possible. That's the hard part though and also takes some time. The bidding process is not for everyone. I am OK with telling people to sod off and I really don't care if I lose a bid. Hell I have no idea what proposals are active. I don't pay attention to that screen at all. it's these little things that people get so caught up with that make them fail. Some people just can't handle rejection. You have to be OK with losing and OK with getting a verbal beatdown sometimes and still come out of it knowing that you're good enough even though some client was a jerk. I don't think a lot of people can handle some of the negative side of what it takes here. It also could be that I have no choice. This is my main source of income, so I have to adapt. I agree that everything she's listed is good practice, but her post really made me take note of how there's no one right way. I've been making a living freelancing on and off for decades, and I do almost none of those things. Despite having been working in content marketing since the late 90s, I don't have a website, and I've never used LinkedIn for freelancing. And, I don't take on local clients at all. Outside of Upwork (a very recent addition for me), 75%+ of my work has come from relationship building and referrals. The bulk of the remainder has come from Craigslist. I only have a cheesy website just to say "look I built this blog in c# mvc and it's not a crappy wordpress site." lol Its basically there to just show something/anything. I don't do anything with it though. I'd rather build a site that's for fun anyway. I'm currently taking this week off except for 1 client to work on my fun site. "The bidding process is not for everyone. I am OK with telling people to sod off and I really don't care if I lose a bid. Hell I have no idea what proposals are active. I don't pay attention to that screen at all. it's these little things that people get so caught up with that make them fail. Some people just can't handle rejection. You have to be OK with losing and OK with getting a verbal beatdown sometimes and still come out of it knowing that you're good enough even though some client was a jerk. I don't think a lot of people can handle some of the negative side of what it takes here." Learn the rules and reg. Read and absorb the info out there before screwing up and then wailing about it. Now, if you've done all that, check the thickness of your skin. 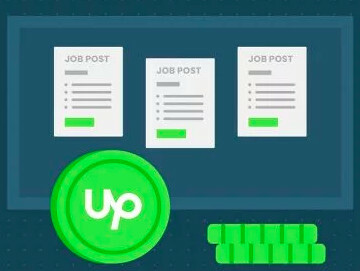 I do find it harder to win work on Upwork than I did on Elance. I think I'd struggle if Upwork was my only source of income, although the work I do get is pretty good. The project I'm working on currently.... when the client saw the first draft, he decided he should be paying twice as much, due to the quality of the work and the fact he needed some extensive revisions. There was no real discussion about it, he'd released the the original amount and set up and funded the extra 100%, before I even had a chance to get back to him. Maybe that means I didn't charge enough in the first place, maybe it means I'm super mega awesome... who knows? But it does go to show that there are decent clients on Upwork willing to pay decent rates. He's not a one off either, there are others. I also disagree with the whole 'year to get going' comment. On Elance I had my first job in less than two weeks and I was in full swing with regular projects after four to eight weeks. Although there are some that never get awarded anything on sites like this... but if you do decent work, out in the effort, have common sense and an ability to market yourself, then there's no reason why you shouldn't do well, or be able to charge decent rates. I've always felt there was a slight stigma attached to saying the you source your work through places like Elance and Upwork. It's the cheapo clients I think that does that.... but the thing for me is... if there's 50,000 jobs posted a month, I don't really care if 90% of them are $1 an hour. If the rest of them pay at or above market rates, then there's still 5,000 decent jobs a month for me to choose from, probably 500 of them in my category. With 60 connects a month, that's more than I could ever need! But still, I'm enjoying my semi-retirement at the moment. Travelling the world, sailing the seven seas and searching for action and adventure in all its forms. "Welcome, humans. I'm ready for you!"